For many years Data were only valuable for their initial and original purpose. The moment the transaction completed, they were considered a burden, good only for off line archiving and eventual controlling. The last few years there was a cataclysmic change. First, cloud storage enabled to keep all past data on line. Second, data mining technology was able to combine and correlate data and produce extraordinary results. Third, Analytics were able to sift through great amounts of data and come to surprising and valuable conclusions. Most important, since every aspect of the economy and our daily routine was captured directly and produced data automatically, Data were not only Big but mirrored every action, every move and generally anything happening in our lives. We have gathered with the Onassis lectures experts from around the world to sketch not only the Technology, but the earth shaking consequences that will inevitably affect our lives and will influence the way we produce, consume, be informed, act and maybe even think in the future. Για πολλά χρόνια τα δεδομένα ήταν πολύτιμα μόνο για τον αρχικό και πρωταρχικό τους σκοπό. Τη στιγμή που ολοκληρωνόταν μια συναλλαγή, εθεωρείτο ως επιβάρυνση, καλή μόνο για την μη άμεσα διαθέσιμη αρχειοθέτηση και τον ενδεχόμενο έλεγχο. Τα τελευταία χρόνια υπήρξε μια κατακλυσμική αλλαγή. Πρώτον, η αποθήκευση στο cloud έχει ενεργοποιηθεί για να διατηρεί όλα τα δεδομένα του παρελθόντος σε απευθείας σύνδεση. Δεύτερον, η τεχνολογία εξόρυξης δεδομένων είναι σε θέση να συνδυάσει και να συσχετίσει δεδομένα και να παράγει εξαιρετικά αποτελέσματα. Τρίτον, το Analytics είναι σε θέση να κοσκινίσει μεγάλα ποσά δεδομένων και να καταλήξει σε εκπληκτικά και πολύτιμα συμπεράσματα. Το πιο σημαντικό, καθώς τα δεδομένα αυτά προέρχονται από κάθε πτυχή της οικονομίας και της καθημερινότητάς μας, δεν είναι μόνο Μεγάλα, αλλά αντικατοπτρίζουν κάθε ενέργεια, κάθε κίνηση και γενικά οτιδήποτε συμβαίνει στη ζωή μας. Στις Διαλέξεις Ωνάση συγκεντρώσαμε εμπειρογνώμονες από όλο τον κόσμο για να σκιαγραφήσουμε όχι μόνο την Τεχνολογία, αλλά και τις σεισμικές αναταράξεις που συνεπάγονται και αναπόφευκτα θα επηρεάσουν τη ζωή μας και τον τρόπο που παράγουμε, καταναλώνουμε, ενημερώνουμε, ενεργούμε και ίσως ακόμη και θα σκεφτόμαστε στο μέλλον. Professor, Sloan School of Management, Massachusetts Institute of Technology, Cambridge, USA. Research Scientist, Computer Science and Artificial Intelligence Laboratory, Massachusetts Institute of Technology, Cambridge, USA. Professor, Department of Informatics, University of Athens, Athens, Greece. Professor, Department of Computer Science, University of Toronto, Toronto, Canada. Program Head, DOE Joint Genome Institute, USA. Professor, School of Electrical and Computer Engineering, National Technical University of Athens, Athens, Greece. 10:00 - 11:15 "Data: The World 's Most Valuable Resource"
11:45 - 13:00 "Big Data Exploration: From Abstraction to Zooming"
Tuesday 11 July 09:30 - 10:45 "The 800 Pound Gorilla of Big Data"
11:15 - 12:30 "Time is Money, But How Much? Elasticity and its Many Faces in Cloud-Based Big Data Processing"
14:00 - 15:15 "From Data Warehouses to Big Data: Is this a smooth road"
Wednesday 12 July 09:30 - 10:45 "Identifying the micro from the peta: tales of big data in the micro world I"
11:15 - 12:30 "Identifying the micro from the peta: tales of big data in the micro world II"
20:00 "So you want to start a company. How to do it in 5 not-so-easy steps"
Thursday 13 July 09:30 - 10:45 "Analytics - 1"
11:15 - 12:30 "Data Base Design is Completely Broken"
14:00 - 15:15 "Retrospection of Social Media Analytics"
Friday 14 July 09:30 - 10:45 "Analytics - 2"
11:15 - 12:30 "Micro - architecture Analysis of Machine Learning Workload"
14:00 - 15:15 "Big Data and Horizon2020: Roadmap for Strategic Research and Innovation - Themes, Examples, Projects"
The Onassis Foundation will support travel and accommodation expenses for up to thirty five Greek students and up to fifteen International students, selected on the basis of their academic performance. The financial aid for the travel of non-European students cannot exceed the maximum amount of the reimbursement provided for the travel of European students. Interested students should attach to their CV, a list of courses taken, their grades and two letters of recommendation. Excellent knowledge of English is required. Students admitted on the basis of their academic performance will receive a certificate after successful participation in the lectures. 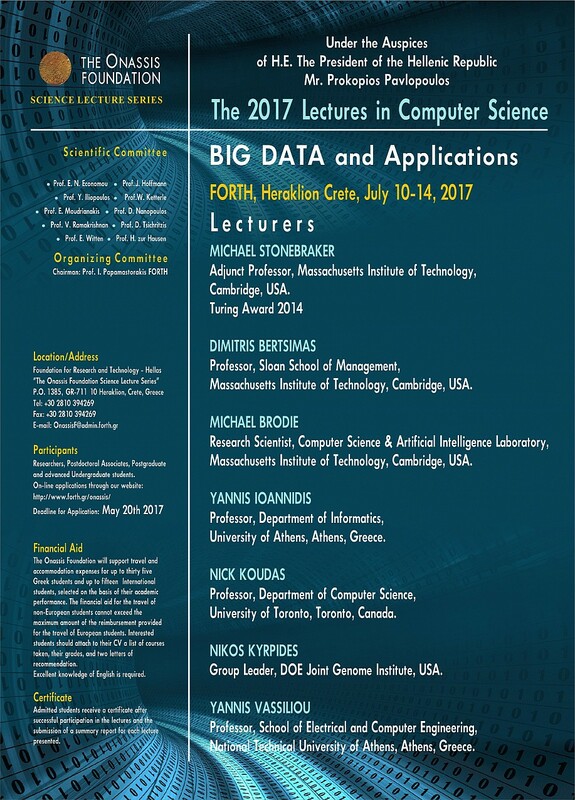 I wish to participate in "The 2017 Lectures in Computer Science"
Please attach your CV (if applicable): (Select your CV file from your computer). Graduate students should attach their CV with a detailed description of their studies so far. Advanced undergraduate students should add to their CV a list of courses taken and their grades. © Copyright 2007 FOUNDATION FOR RESEARCH & TECHNOLOGY - HELLAS, All rights reserved.